With recent interest in Birdsong and the fascination with the war underground, there is a tendency to forget that mine warfare was not just restricted to Flanders and the Somme. It took place on many other parts of the Western Front and some of the Great War battlefield’s most impressive mine craters are in the French sector, not where the British Army fought. This image shows a mine crater in the Champagne battlefields near Reims. 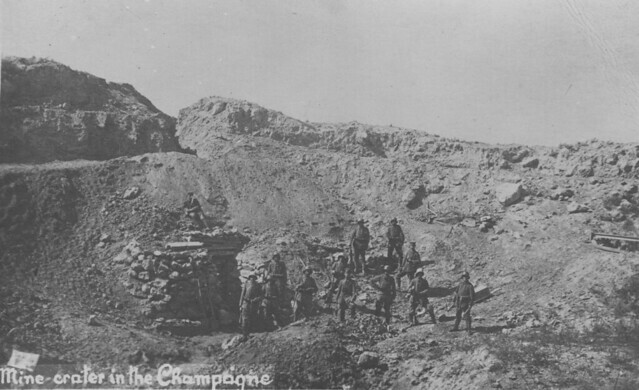 The chalk of the Champagne was similar to Picardy, so it proved to be well suited to tunnelling operations, especially as the front here was static for so long. The Germans are wearing Stahlhelms so this image likely dates from 1917 or 1918; perhaps during the German offensive here in 1918 when much of the area was overrun until the final French offensive broke the German defences in the autumn of 1918. This entry was posted on 01/09/2012 by sommecourt. It was filed under Birdsong, Champagne 1915, Champagne 1918, France, French Army, French Front, German Army, Great War, Tunnellers, Western Front, WW1 and was tagged with Champagne, Mine Crater, Mining, Tunnelling, War Underground, Western Front.